We've talked a lot about flexible electronic skins offering a glimpse at the future of health and fitness monitoring, and now researchers want to take things further by displaying real time biometric data right onto your hand. The talented team from the University of Tokyo in collaboration with Japanese printing company Dai Nippon Printing have devised the e-skin that is comprised of a deformable display and a lightweight sensor constructed from a breathable nanomesh electrode and wireless communication module. 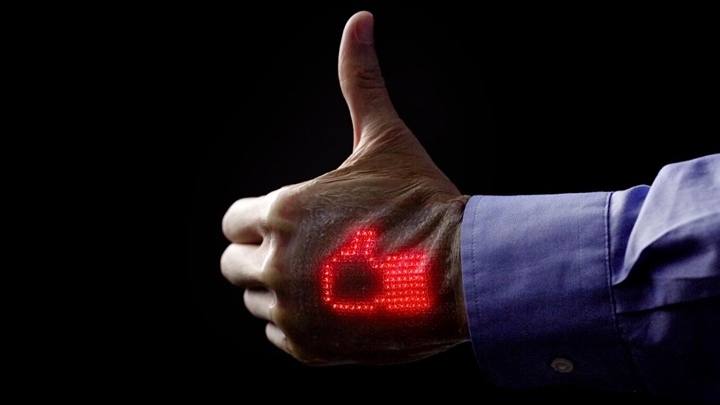 It also consists of an array of 16 x 24 micro LEDs and stretchable wiring mounted on a rubber sheet that is able to display basic graphics onto the skin. The skin is capable of monitoring vitals like heart rate, so the idea is that if there's something up, someone will be able to look down at your hand and know that they need to act. The team of researchers believes its stretchable display offers better durability than previous examples of the technology. The inbuilt sensor can also be worn for a week without causing any inflammation and can be paired with a smartphone letting you store data in the cloud. It's hoped that this electronic skin will take the pressure off home healthcare systems and reduce the burden on patients and family members providing nursing care for older members of the family. So when will we see this electronic skin used on a grander scale? Dai Nippon Printing hopes it will be ready to go mainstream within the next three years once it can overcome technical challenges like improving reliability and mastering the way it can use the tech on larger areas of the body.